Wow - so behind - trying to get caught up on your discussions. So 20 year time frame - wow that's so close. I hope they get on the ball and start thinking of solutions. Now that we appreciate how dangerous methane is, we've just discovered an overlooked reservoir holding as much as Arctic permafrost, but even more vulnerable to evaporating. This suggests that when the West Antarctic Ice Sheet melts the methane released will give a big kick, further accelerating climate Destabilization. So that diagram above for Arctic Methane Planetary Emergency needs a companion diagram: Antarctic Methane Planetary Emergency. Note the bubbles in the left part of the image, compared to normal ocean on the right. Russian scientists have discovered spots in the Arctic Ocean where mass emissions of methane can be observed. According to the press-service of the expedition aboard The Viktor Buinitsky research vessel, the diameter of some of the ‘methane fields’ found in the northern part of the Laptev Sea exceeds 1 kilometre. Were the vessel to sail into that bubbling methane field, it might sink. Large outgassings of methane temporarily decrease water density, so stuff which normally floats sinks. Will this pose a shipping hazard to vessels plying the Arctic passage in summer? The evidence mounts. Obama needs to address these issues. For whom is one to vote? Romney is out, Obama doesn't realize the economic problems caused by his administration, no one is taking up the climate change or getting off fossil fuels. What intelligent options exist? This diagram illustrates methane reservoirs in the Arctic. 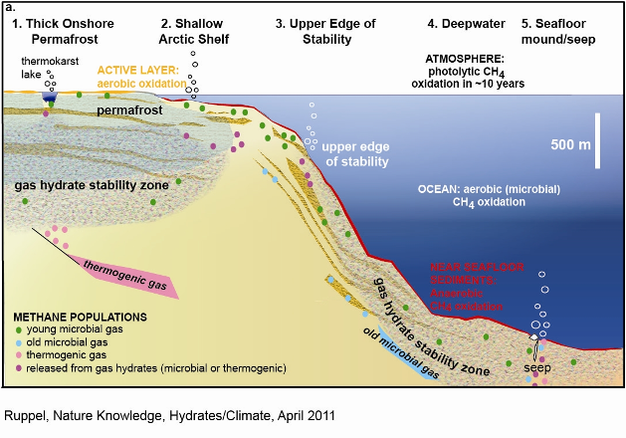 The Eastern Siberian Arctic Shelf is a shallow area of the Arctic Ocean seafloor with vast methane deposits trapped beneath a subsea permafrost layer. Warming has already created over a hundred holes where methane is bubbling out. The research results, published in the March 5, 2013 edition of the journal Science, show that the permafrost under the East Siberian Arctic Shelf, long thought to be an impermeable barrier sealing in methane, is perforated and is starting to leak large amounts of methane into the atmosphere. Release of even a fraction of the methane stored in the shelf could trigger abrupt climate warming. Not at all good news! Response: stay calm, explore options, publicize research, stay flexible. Respond to events as they occur. Enjoy the present moment with a full appreciation for all the full-of-wonder gifts we enjoy. Watch Susan Jacoby - The Dumbing Down Of America. I like these illustrations - very educational. The Arctic Methane Emergency Group of climate scientists warns that the planet stands at the edge of abrupt and catastrophic climate change. ... some of the world’s most renowned climate scientists formed AMEG, because they were prompted by indisputable signals of the beginning stages of massive releases of methane, thus, threatening an extinction event on planet Earth. ... AMEG has studied key non-linear trends in the Earth-human System and reached the stunning conclusion that the planet stands at the edge of abrupt and catastrophic climate change as a result of an unprecedented rate of change in the Arctic. According to David Wasdell, International Coordinator, Meridian Programme: “A runaway climate change is now clear and beginning to be quantified for the first time… the greatest threat we face as a planet… The rate of change we’re generating in the current situation is between 200-300 times faster than that experience of any extinction event apart from the asteroidal impact. ... the albedo effect is collapsing in the Arctic. A collapsing albedo effect is ominously apocalyptic for the Arctic, and for the world. And, disturbingly, Arctic albedo is already in the collapsing stage. This will inevitably lead to ever more methane emissions and a vicious cycle of feedbacks leading to an extinction event, probably unstoppable. The meeting is bringing together Nasa's acting chief scientist, Gale Allen, the director of the US National Science Foundation, Cora Marett, as well as representatives from the US Department of Homeland Security and the Pentagon. This is the latest indication that US officials are increasingly concerned about the international and domestic security implications of climate change. Senior scientists advising the US government at the meeting include 10 Arctic specialists, including marine scientist Prof Carlos Duarte, director of the Oceans Institute at the University of Western Australia. Duarte is lead author of a paper published last year in Nature Climate Change documenting how "tipping elements" in the Arctic ecosystems leading to "abrupt changes" that would dramatically impact "the global earth system" had "already started up". Duarte and his team concluded: "We are facing the first clear evidence of dangerous climate change." Extreme weather events over the last few years apparently driven by the accelerating Arctic melt process - including unprecedented heatwaves and droughts in the US and Russia, along with snowstorms and cold weather in northern Europe – have undermined harvests, dramatically impacting global food production and contributing to civil unrest. "The weather extremes from last year are causing real problems for farmers, not only in the UK, but in the US and many grain-producing countries. World food production can be expected to decline, with mass starvation inevitable. The price of food will rise inexorably, producing global unrest and making food security even more of an issue." East Antarctica is releasing methane. ... very high methane levels that have been recorded over Antarctica recently. 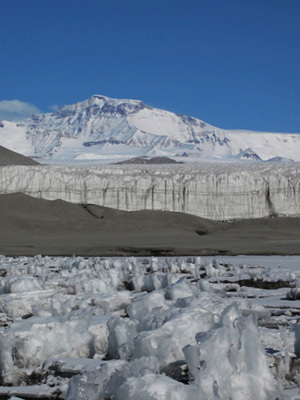 These very high methane emissions occur on the heights of East Antarctica. 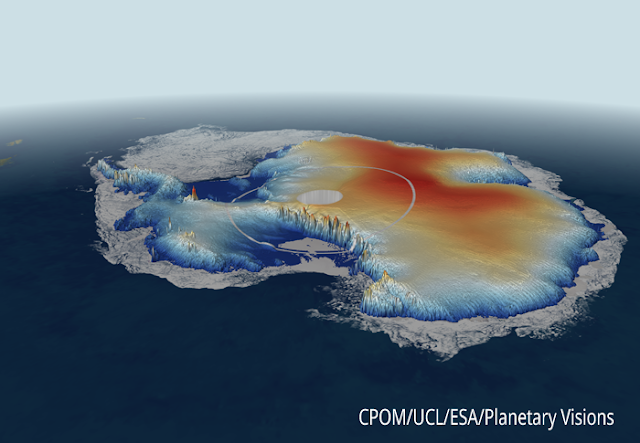 The map below shows the highest altitudes on Antarctica colored red.